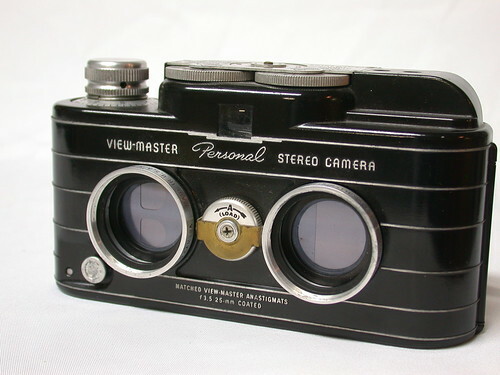 The View-Master Personal Camera is a stereoscopic camera used for the creation of View-Master slide reels, usable in any View-Master viewer. Created in 1952 by the Stereocraft Engineering Company for Sawyer's. 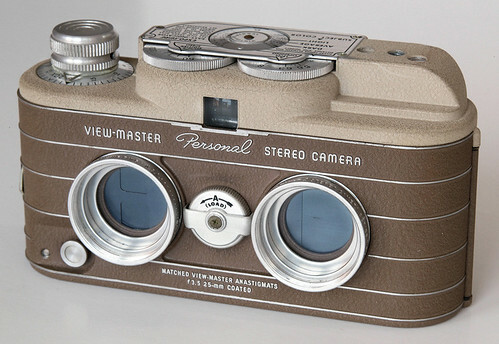 Using 35mm slide film, it allowed the user to create three-dimensional View-Master reels. This was a perfect camera for vacations as the number of exposures are about doubled per roll of film due to the size of the photo and the unique function for taking photos. When you begin taking your photos, the lenses are travelling across the upper portion of the film. When the film is at its end, the photographer would turn a dial located on the front of the camera between the lenses from "A" to "B." This would switch the lenses from the top portion of the camera to the bottom portion of the camera, allowing the photographer to take another set of photos along the bottom portion of the film. 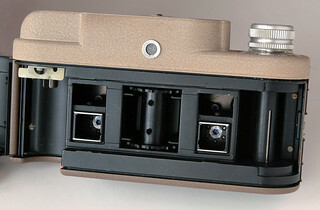 Another unique feature of the camera was the "Expo-sure" metering. While not true metering, it gives very close results. As you adjust the f-stop and shutter speed, the dials will adjust the Expo-sure meter to show you what conditions those settings will be good for, i.e. sunny, cloudy, etc. This is also based on ISO, which is to be adjusted each time you put film with a new ISO into the camera or twice a year (settings are slightly different for winter and summer). Slides are mounted in personal reel blanks, which are modifications of the widely available commercial reels. In order to insert the slides, they are first punched out in the slide cutter made for the camera. Then, using the reel inserter tool, the chip is inserted snugly into the reel. Personal reels were still being made in the early 90s, however, when the machine that made the reels broke, Fisher-Price (current owner of View-Master) chose not to fix the machine and official reels have not been made since then. Currently, the only way to obtain the reels needed are on second hand markets. A popular, cheaper alternative is through the use of Russian-made Stereo Meopta reel blanks. Shutter Speeds Continuously adjustable, 1/10 - 1/100 sec. and "B"
This page was last edited on 28 January 2018, at 15:13.